We get quite a lot of food fads in New York. Some are big and national (like kale or ramps). Some are small and local. 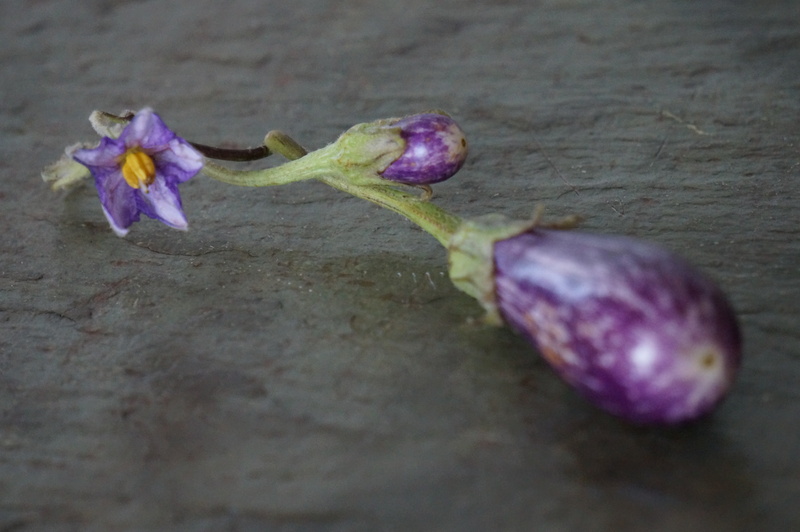 The last few weeks have revealed one such small and local fad: fairy tale eggplants. No, they don’t turn into a horse-drawn carriage and whisk you away to the palace ball. Nor do they grant you three wishes. They are simply a breed of eggplants that grows really small, somewhere between 1 and 2 inches. 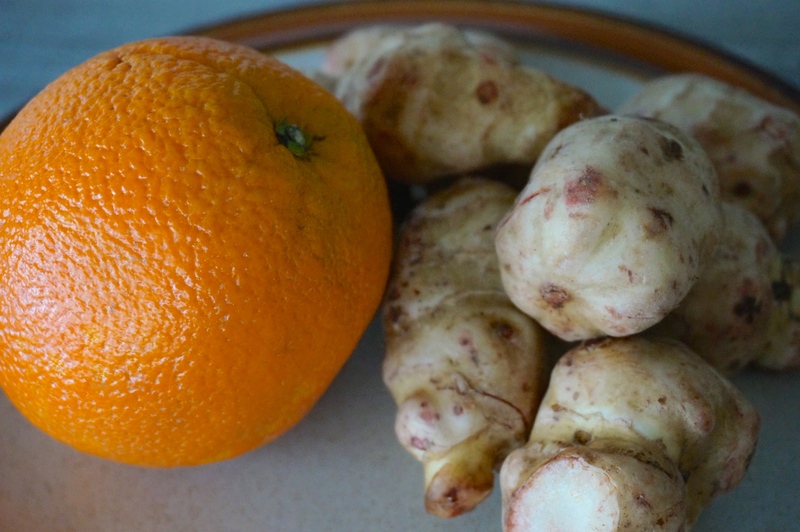 I had never heard of them before until this fall, when suddenly they appeared at the local markets and I started seeing some online chatter about them (like here and here). Steve and I bought some, of course, and had them simply roasted in the oven. I don’t think it was the best preparation for them, but we appreciated their delicate form and sweet taste. I’ve always had a love-hate relationship with eggplant. I love to eat it but I’ve always hated cooking it. It seemed to me that every single recipe for eggplant called for salting it and draining the water out of it, or for charring it over an barbecue fire, something most New Yorkers can only dream of. 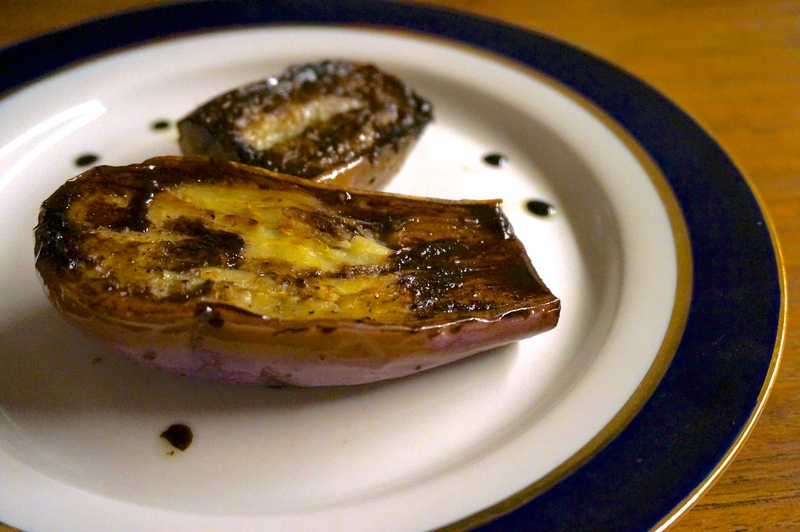 Whenever I tried to cook eggplant it always ended undercooked or burned. 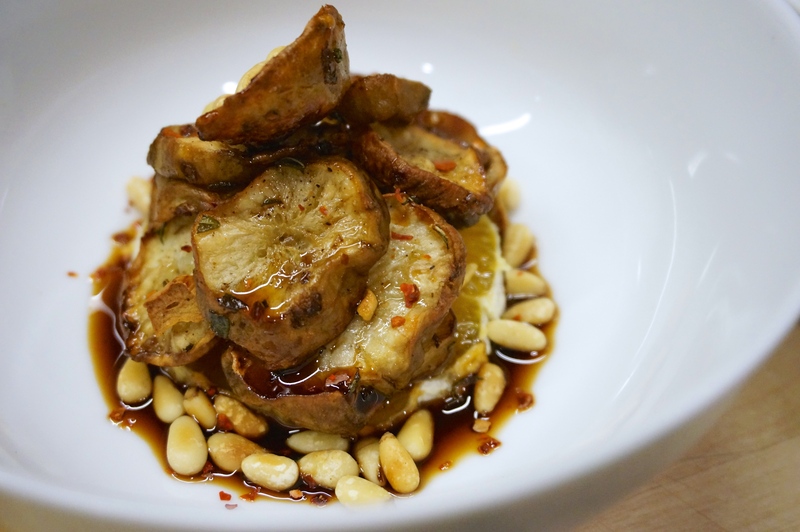 So, I generally stayed away from eggplant until I found this recipe. It turns out, you don’t have to go crazy with pre-cooking preparations for eggplant. You can just cook it on the spot, with a combination of sautéing and steaming in a single pan. No salting, no charring, and no draining. Since then, I’ve made this as a side dish countless times. Though I still dream of a barbecue fire where I can char eggplant for some delicious baba ganoush. Note: This recipe works best with long and skinny eggplants, such as japanese eggplants. If you have the more traditional thicker dark purple variety, slice it crosswise in 1.5 inch sections. Slice eggplants lengthwise in half. Lightly salt and pepper the slices and heat a sauté pan for which you have a lid over medium-high heat. Add olive oil to pan, and when it shimmers add eggplant, cut side down. Lower heat to medium and cook, covered, for about 6-7 minutes. Turn eggplant slices cut side up, recover the pan and cook for an additional 4-5 minutes or until eggplant is soft. Turn the eggplant slices one more time, cut side down. Turn heat off. Immediately add balsamic vinegar in the pan. Cover the pan and shake back and forth for a few seconds. Let it rest, covered for 2-3 minutes, until the vinegar caramelizes a little. Serve eggplant slices with balsamic vinegar sauce spooned on top and sprinkled with a little flaky sea salt and additional ground pepper.